TORONTO—What does parenthood mean to us? Whether we have children or not, we can’t avoid this question as we go through our lives. Parenthood is fundamental to us as human beings, and questioning whether to have children forces us to re-examine who we are and what our place in the world is. 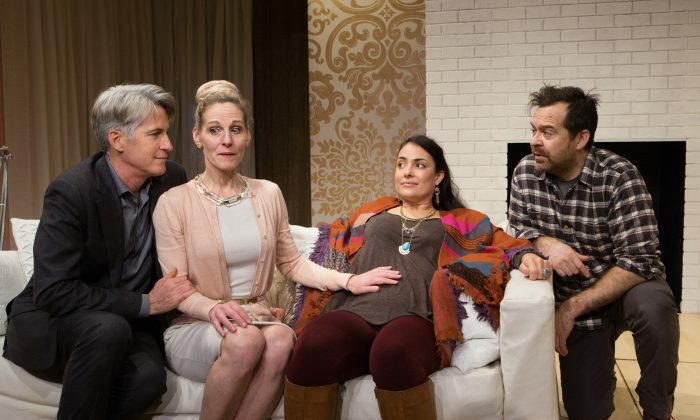 Anna Chatterton’s play “Within the Glass,” currently running at the Tarragon Theatre in Toronto, explores this question through two couples who have sought in-vitro treatments to conceive a child. A clinical error implants two couples with the other’s embryos. One embryo takes, and the woman is pregnant with the other couple’s child. It is a mishap of technology that leads the characters to face this fundamental question: what does parenthood mean to each of them? The scene of the play takes place as the couples meet for the first time for dinner in the home of Darah (Philippa Domville) and Michael (Rick Roberts). Scott (Paul Braunstein) thinks they have come to announce they will terminate the pregnancy, whereas his wife Linda (Nicola Correia-Damude) says she has grown attached to the baby as her own and wants to adopt it. (The law in Ontario states that the biological parents have the right to the child). However, Darah and Michael—who have undergone unsuccessful in-vitro treatments for more than six years—are unwilling to relinquish their last hopes of having a family. They are in their mid-forties, and successful treatments have become unlikely. Scott and Linda are much younger and already have a little girl. Linda eventually agrees to give Darah and Michael the baby once it’s born; however when Michael asks her to sign a contract renouncing all rights, she feels betrayed and suddenly changes her mind. Fundamentally, the play explores the question of selflessness and what it means to put others’ needs before one’s own. Each person inspires a certain degree of empathy, as each has his or her own challenges to overcome. Scott finds it difficult to accept that his wife wants to carry to term a child that is not their own. For him, it is a fetus, not a baby. Linda, however, is more in touch with nature and life—now that she’s pregnant, her strong maternal instincts kick in and she feels that her body has accepted the baby as her own. She has a more holistic approach to life than the headstrong Darah, who is used to getting everything she wants—a fine house, loving husband, good career. But the one thing she wants the most—a baby, and the experience of pregnancy and giving birth—eludes her. Michael also demonstrates a secret desperation to have a child. He emphasizes that a child is equally as important for the man as for the woman. The play touches on a few important themes—the joy of pregnancy, the need of having one’s own genetic baby, the natural bond between mother and child, and the pitfalls of technology in causing such clinical mishaps. (The play is loosely based on a true story). “Within the Glass” also alludes to possible reasons that may account for one’s not having a child, including the common one of putting off children to focus on career until it is too late. It also touches on deeper values, such as when Linda refers to an Indian belief that says an infertile woman is cursed to be infertile as payback for sins committed in another life. Fundamentally, the play explores the question of selflessness and what it means to put others’ needs before one’s own. It doesn’t resolve this, however—the characters are unable to overcome their narrow viewpoints, although they come close at one point. Still, there is an open door. The play is not finished at the end, inviting the audience to join in on the debate. What is right? What would you have done? Will you judge the characters for their faults? Will you take sides? And, most of all, will you reflect upon your own decisions in life?